While we celebrate the successes of high achievement and scholarship dollars earned, we often define “success” in different ways. We’d like to share a regular rotation of some of the encouraging ways God is at work in the lives of our students, alumni, faculty, volunteers, etc. These are just a glimpse into the many ways the power of the Lord is at work in and through Restoration Academy. Marquis working with students in our Summer Enrichment program. Marquis Grays, Class of 2014, came to Restoration Academy for his senior year. During his time at RA, Marquis was able to secure his foundation in reading and math in order to become college ready. 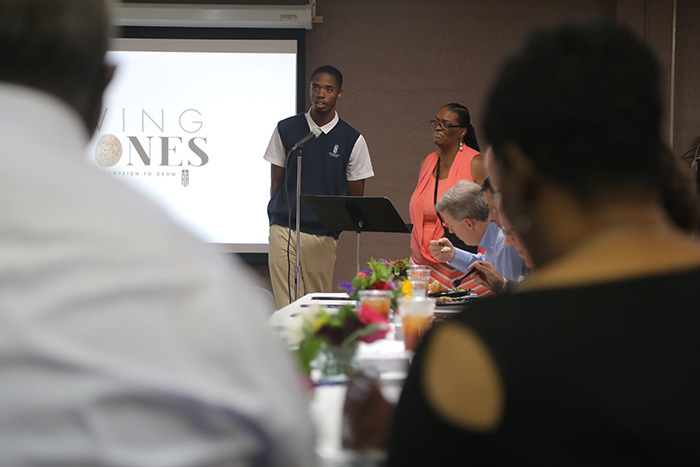 More importantly, Marquis was exposed to the Gospel of Jesus Christ through his mentors and teachers. A standout basketball player, Marquis earned a four-year scholarship to Faulkner University where he will graduate in May 2019 with a degree in elementary education. What I always say to parents who are looking for an outstanding school, “My children go to Restoration Academy — the best school in the state of Alabama. It’s a Bible-based, family-oriented school. Their focus is on the whole child. Restoration Academy’s staff is fair, loving, understanding, and caring. The teachers don’t just teach at school, they teach everywhere they set their feet. It takes a village to raise a child, and Restoration Academy ensures that your child has that village. Restoration has not only been encouraging me, but RA has been encouraging my whole family as well, especially when I was diagnosed with breast cancer. When RA’s staff found out I was going through cancer treatments, they wrapped their arms around us and prayed for us everyday…they made sure the children had what they needed to be successful in school…I truly don’t think we would have made it without God and the prayer warriors at RA…thank you to the greatest school ever." A lot of different churches and individuals pour into our kids. But we’re always grateful for opportunities where our students can get out and pour into others. Jesus called us “to love our neighbors as ourselves.” Many of our children understand that as a principle, but it’s even more important when we give our young people an opportunity to practice loving their neighbors. This past July our Chaplain, Sam Cargo, and our former Executive Director, Ben Sciacca, were able to take three sophomores and three seniors to Washington D.C. for a missions trip. While they were there, they stayed at the Southeast White House in inner-city D.C. The students were able to do aesthetic clean up around the community, feed and visit with the homeless, and provide activities for some of the local youth during their summer program. The group was also able to tour the capital, visit the Washington Memorial, and spend time at the MLK and Lincoln Memorials. We are grateful for our partnership with Reel Life Ministries and the opportunity that this trip afforded us to minister to and experience the rich history of Washington D.C.
What do you get when you combine a math degree from UVA, a willing spirit to impact young people for Jesus, and an open schedule? You find a superstar volunteer. Betsy Colvin is a math-focused volunteer who works with students every day at Restoration Academy. Along with her husband and four children, the Colvins have made tutoring a family affair. Many times, they invite students into their home for visits or even to live. The relationship with the students doesn’t end after high school graduation. 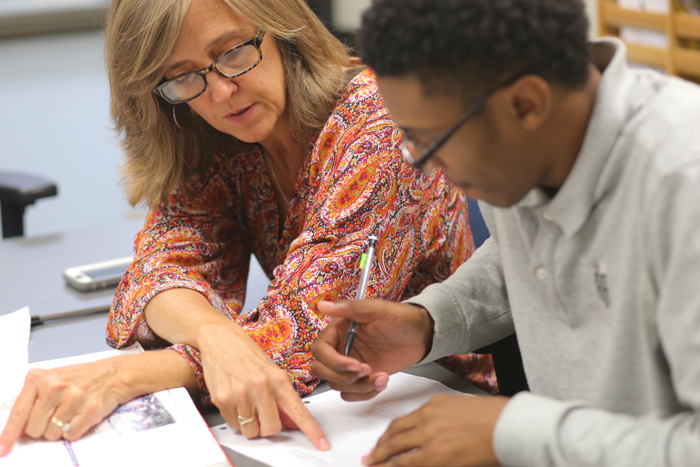 Betsy continues working with students ensuring success in college. Former AP Calculus teacher Connie Edwards pictured with (from L to R) Trent McMullen, Stuart Phipps, Brendan Jones, Brian Rodgers and William Creagh…all of whom earned a 5 on the AP Calculus exam. Only 1.8% of high school graduates achieve the highest score of a five on the AP Calculus (AB) exam. Since 2013, all seven of the students who have sat for the AP Calculus (AB) exam have achieved a five! At Restoration Academy, we are able to meet students at the point of their need in order to remediate them in math skills or push them to achieve to their highest potential. While not the priority, our achievement in AP testing points to the excellence with which we approach our students.